Caused by a staphylococcus bacterial infection, an eye sty is essentially an inflammation in the glands at the eyelash base. An eye sty can affect the outside or the inside of the eyelid and is usually tender and red. There can be a single sty or group of sties affecting your dog's eye. Eye sties can be painful for your pet, but they usually drain naturally. It is still important to examine the situation carefully and use an effective sty in dog's eye treatment to speed up recovery. 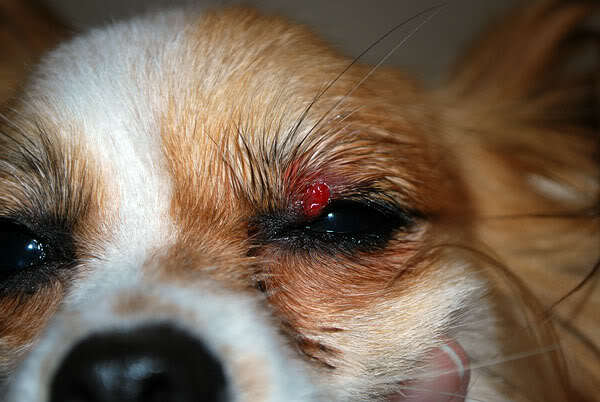 Just be sure to check that it is a sty and not a cyst or bump on dog’s eye. Whether it's an infection or clogged hair follicles, washing the eyelid will usually help remove whatever's causing irritation and swelling. Take a plain, clean washcloth and clean your dog's eye carefully and tenderly. 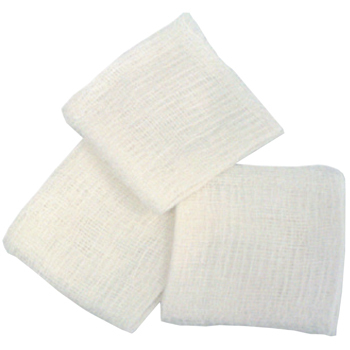 Alternatively, you can use gauze pad for cleaning. Mild heat is another treatment that will help eliminate swelling and assist the infection in draining. Applying a warm compress of teabags will assist the dog’s eye glands to drain quickly. Simply soak a teabag in warm water. Place the teabag on the eye of your dog for 5-6 minutes. Repeat the same process at least a couple of times a day until the sty drains out. Be sure to clean the affected area after the infection drains to prevent re-infection. Be sure to resist the temptation of using a utensil to pop a sty. This will aggravate the whole situation and may even spread the infection elsewhere. It is important to clean the area thoroughly when the abscess is draining. You may have to clean the infected area 3-4 times a day. Use a clean warm washcloth for cleaning. If the condition persists and the sty doesn't disappear in a couple of days of trying home remedies, call your vet, as it could be a more serious condition that demands medical treatment. Simple home remedies may or may not work, but if they don't, you may have to use a more professional sty in dog's eye treatment. Using medicated ointment or eyewashes can be the first choice. You can find them easily. Be sure to apply it properly – you need to tilt your dog's head up, pull down the eyelid, and let the ointment drip down from the tube. Your vet may prescribe some oral antibiotics as well that you can mix in your dog's food. Cortisone is another option that a veterinarian uses to reduce severe inflammation and swelling. If a sty doesn't go away after using warm compresses, ointments and medications, or is interfering with your dog's vision, your vet may decide to remove it surgically. The process involves opening the sty with a sterilized scalpel. The infection drains out and is wiped away by the vet. Your vet may decide to sedate the dog before the procedure for safety. It is important to use basic saline eyewash after the procedure. It is a good idea to ask someone else to hold your pet. You may want to use a muzzle as well for added safety. As dog sty can be painful and your dog may already be irritated, you will be better off wearing some latex or similar type material gloves while examining or treating a dog sty. Moreover, wearing protective gloves will also help you to avoid any contact with bacteria. Alternatively, your protective gloves will protect your dog's eye from becoming infected with something you may have on your skin. Even when you've used gloves, be sure to wash your hands properly after treating a dog sty. When a dog sty doesn't respond well to basic home remedies, it usually necessitates a visit to the vet who will confirm if it's really an eye sty or some other type of infection. Sometimes an ordinary looking sty can be a more serious condition, such as a benign or cancerous tumor. Only a professional can help diagnose such problems and suggest a treatment option. In some cases, your dog may have inflamed eyes or eyelids when it is allergic to something in its own environment. It could be as simple as a particular ingredient in its shampoo. So, be sure to check for such issues when analyzing the problem and finding a treatment option.